Landgasthof Diendorfer Auberg, Hotel Austria. Limited Time Offer! Landgasthof Diendorfer. "Landgasthof Diendorfer" has received 3 stars. This hotel is a convenient base point from which to discover Auberg. Dinner can be served at the onsite restaurant. Breakfast is served each morning and gives you a good start to the day. 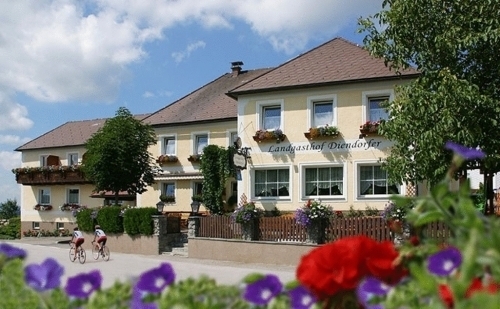 "Landgasthof Diendorfer" provides you with Internet access. Landgasthof Diendorfer is located in the Mühlviertel region near Haslach on a small hill, overlooking the beautiful Bohemian Forest. It offers free Wi-Fi, free parking and a breakfast buffet. Surrounded by meadows and forests, Haus Sanitas is 3 km away from the town of Rohrbach in Upper Austria’s Mühlviertel region. It offers apartments with free LAN access. Surrounded by the scenic Bohemian Forest, Kräuter- & Wanderhotel Bärnsteinhof is located in the small town of Aigen in Upper Austria’s Mühlviertel region. Each room has a balcony.